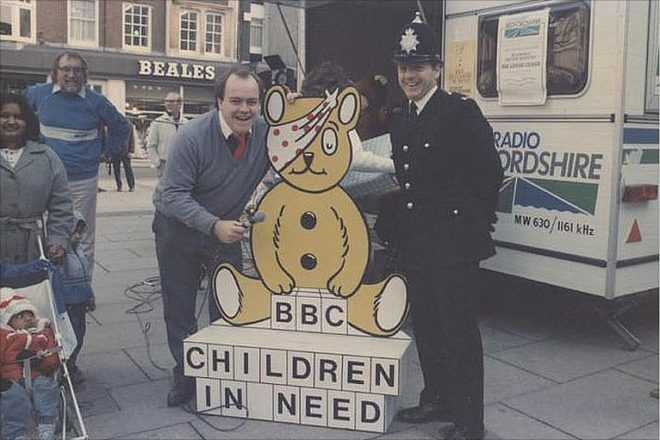 The BBC’s Children In Need Charity has been around since 1980 when it first broadcasted. And has since raised over a record-breaking 600 million pounds. Going directly to the children and young people in the UK and around the world who are underprivileged and have special needs. You may have seen before that the annual Television show airs celebrating the charities achievements. Expressing how other people can get involved and shows us the most inspirational children being affected by disability. The BBC’s first broadcasting of the charity was held in 1927 on Christmas day. It was a 5-minute radio broadcast which many people around the country tuned into. raising around £1,200 which in today’s standards would translate to around £28,000! All this money was donated directly to children’s charities. By 1955, a televised appeal took place called the Children’s Hour Christmas appeal, this would then carry on airing, raising £625,000 for children who are disadvantaged until 1979. After this, cartoons were made starring the well-known characters of peter pan and tom and jerry until 1980. The telethon was finally broadcast with a series of short clips and videos linking to the community. This carried on for literally decades, in that time becoming a registered charity and raising millions for the underprivileged! 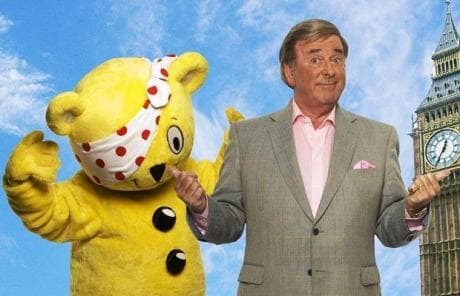 The “Pudsey Bear” mascot and Wogan the presenter for almost 30 years are iconic to the UK. the logo was created in 2007 which we still identify the event with to this day. 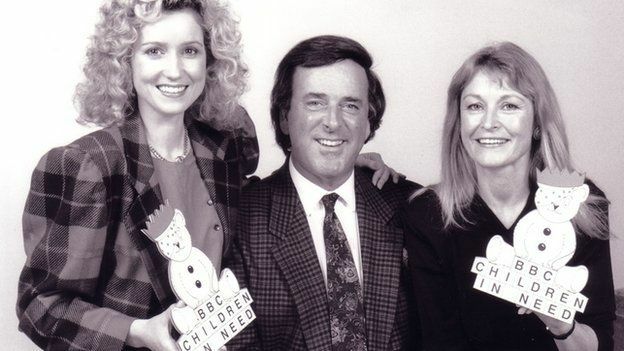 Wogan, the longtime presenter of the charity, would meet and give the hosts of fundraisers rewards to thank them for helping and raising money. This would usually air on Television. There has been many different types and designs of Pudsey bear, and before the iconic yellow colour, it was traditionally brown with the ‘ABC’ start of the alphabet down his buttons! Here a fundraiser and a police officer stand and pose next to the 1980-2006 Children In Need logo. 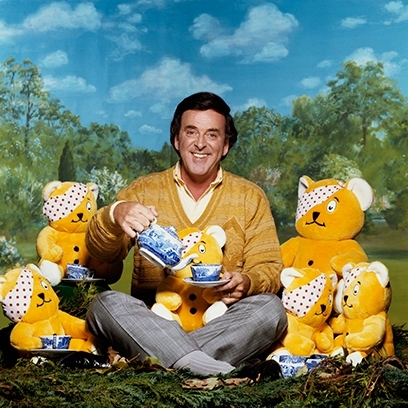 Wogan was a really fun presenter and didn’t mind being a big-kid on screen. He presented the Children In Need show up until 2014 when illness left him unfit to carry on presenting. But thank you, Wogan! Many children and adults now will thank you for years and years of such great shows and charitable events you took part in.